There were many warnings from friends and family that the food in England just isn’t that good. Don’t worry…we didn’t go hungry and we certainly didn’t suffer too much along the way. Truth be told, the breakfasts were the best meals we had, but alas, they went undocumented! I’m going to give your our top three meals of the trip, plus one awesome dessert. It’s merely a coincidence that there is one meal from each of our three destinations! 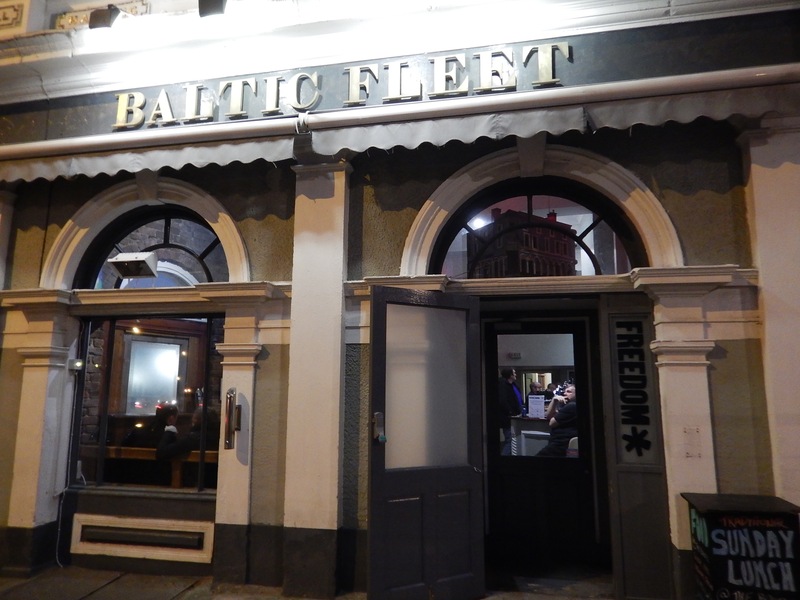 In third place, one of our favorite places in Liverpool, and the last place we eat before we leave town, The Baltic Fleet Pub. This 19th century pub is just steps from our hotel, and a very welcoming place. They don’t serve food at dinner time, and they don’t serve every day either. It’s not until our third visit that we actually get to eat. 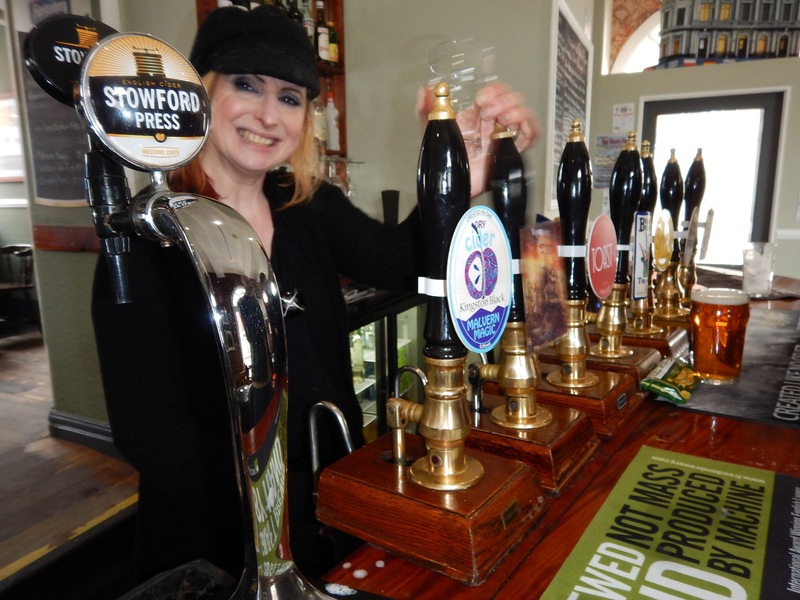 This pub comes with a lot of history, Kim – the Liverpool Pub server of the year, and the Wapping Brewery right in the cellar. 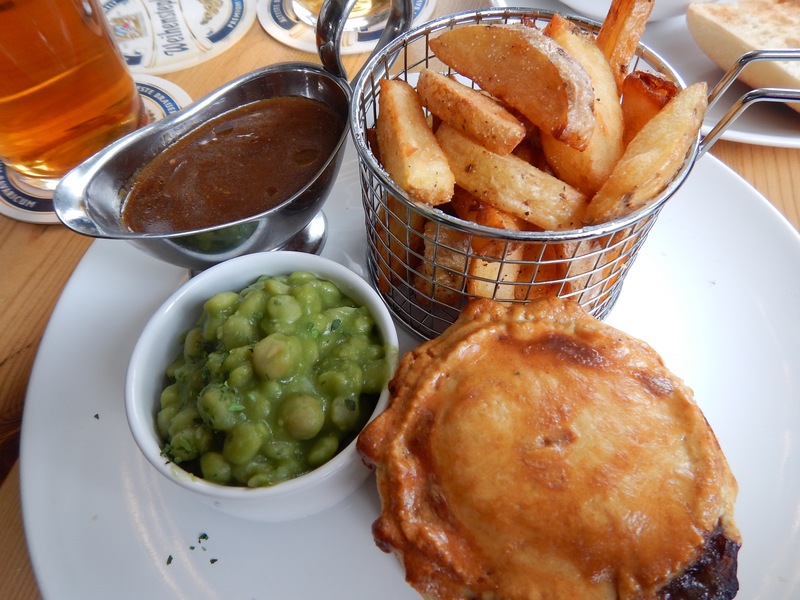 They are known for their scouse and meat pies. 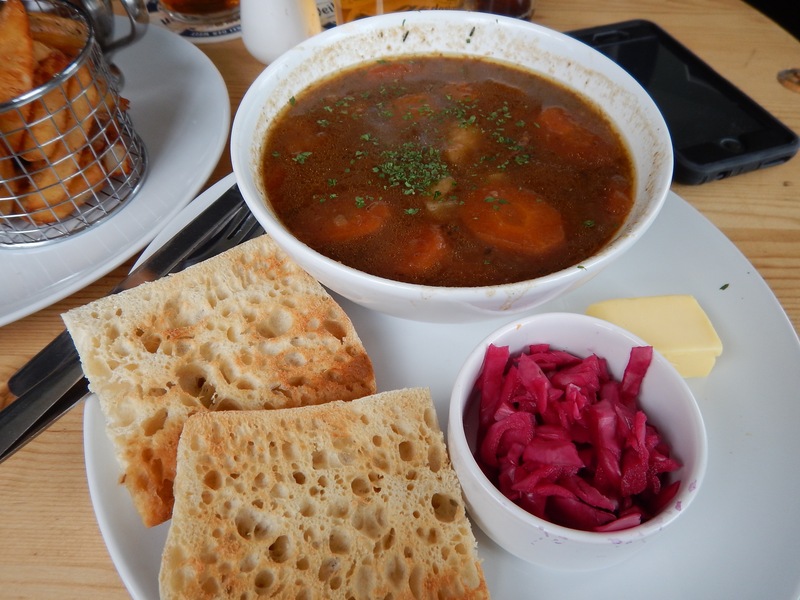 Scouse is lamb or beef stew which was popularized in Liverpool and eaten by sailors all over northern Europe. Just so you know, scouse is also something called Liverpool English, or the accent or dialect specifically linked to this area. 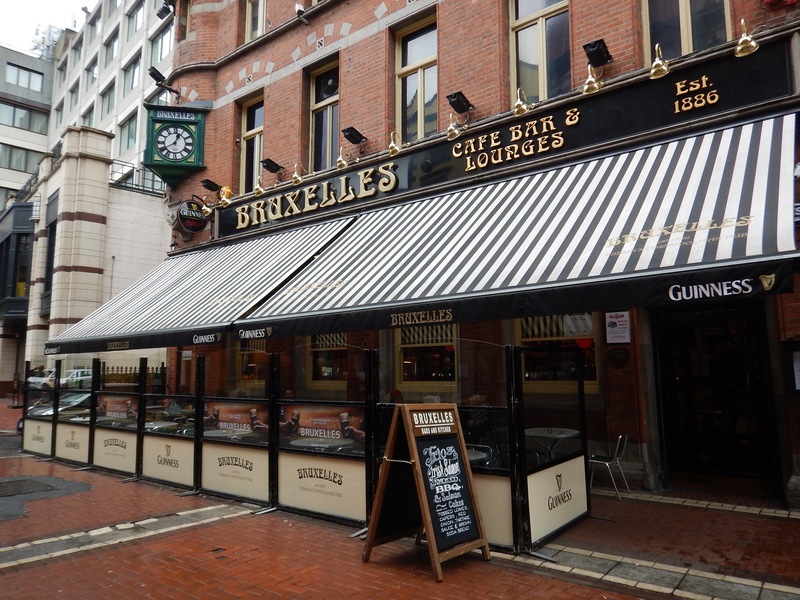 In second place, a lunch we had at Bruxelle’s in Dublin. 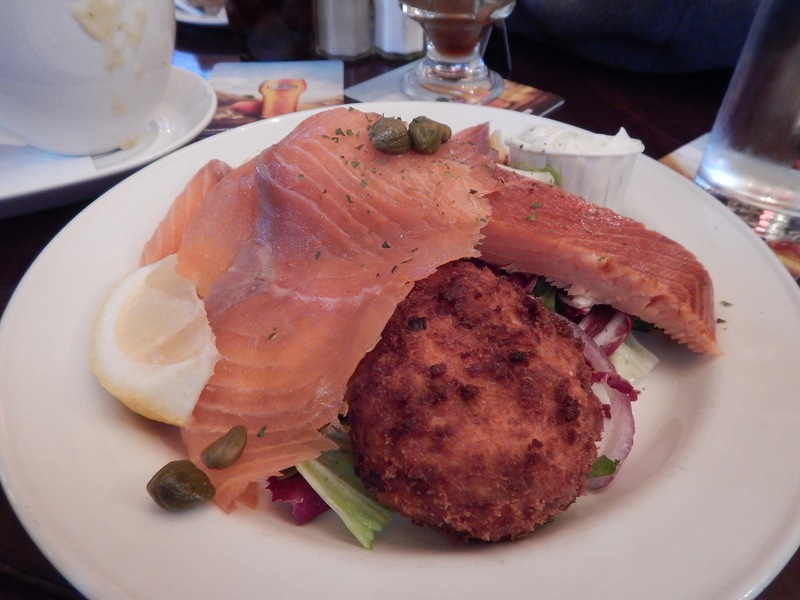 It’s It’s called Irish Salmon 3 ways: smoked salmon, BBQ salmon and a crispy salmon cake. It It It came with brown bread which was like a sweet soda bread. 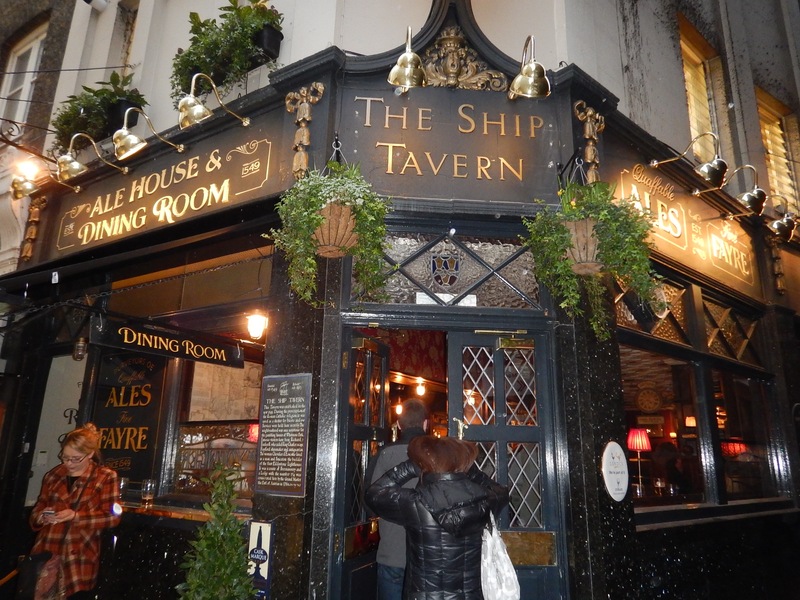 And our winner is a dinner we had in the upstairs dining room at the Ship Tavern in London. This is one of the oldest pubs in London. 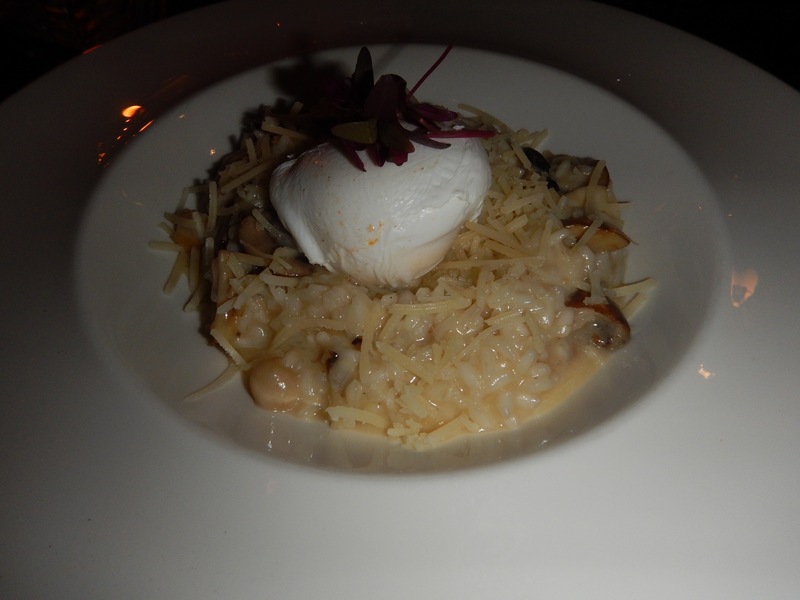 Roger orders the lamb 3 ways (variety is important) and I eat risotto with mushrooms topped with a poached duck egg. 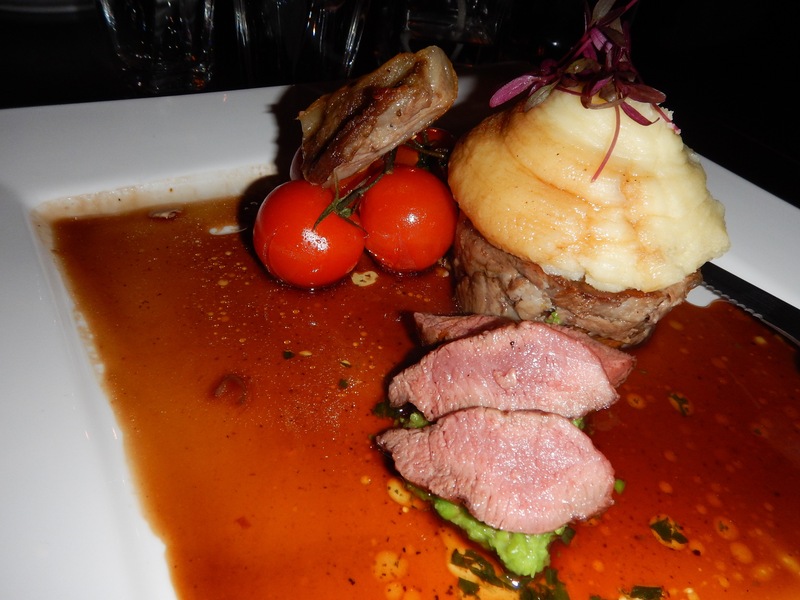 On Valentine’s Day, we enjoy a prix fixe lunch at Carlucci’s, an Italian Cafe near The Cavern Club in Liverpool. It comes with dessert for two. This is not the winner of the best dessert because it’s the only dessert we have! It’s artfully presented and everything on it is delectable. 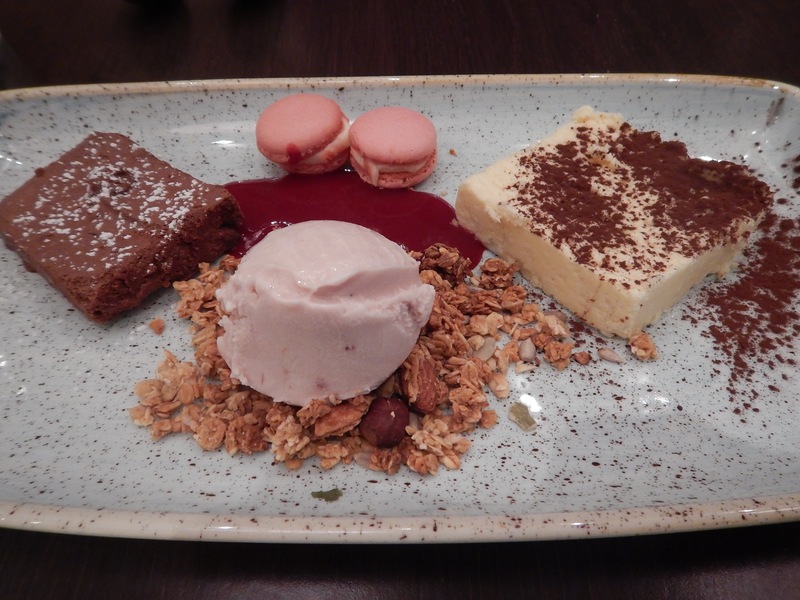 Beautiful rich, creamy white, and dark chocolate mousse, a flavorful gelato, granola and a raspberry sauce with 2 adorable mini-macaroons. Molto Benne! The food complaint is that everyone is serving just about the same thing. Fish and Chips with very bland fish in huge portions, pies which are usually yummy pastry filled with little morsels of food, or borderline overcooked burgers. For the most part, unless you try the Italian (we did 3 different times) or even the Chinese (which we had in Liverpool) your choices are pretty limited. Thanks for joining us on this trip over the pond. Next time you’ll see us back with our bike on our next adventure. Please click the link to follow this blog and get it delivered into your email upon publication! Cheers! Next Post Back in the “travel” saddle again!